Construction spending totaled $1.329 trillion at a seasonally adjusted anfrom the upwardly revised August rate and up 5.5% from September 2017 to a record high (without adjusting for inflation), the Census Bureau reported . Public construction declined 0.9% for the month but increased 11% year-over-year (y/y). Of the three largest public segments, highway and street construction declined 1.1% for the month and grew 8.6% y/y; educational construction, 1.2% and 9.9%, respectively; and transportation, -0.9% and 15% (31% y/y for state and local airport construction and 3.8% for other public transportation—port, transit and passenger rail). Private nonresidential construction spending edged up 0.1% for the month and increased 7.2% y/y. Of the four largest components, power (electric power plus oil and gas pipelines and field structures) fell 1.6% for the month but rose 9.2% y/y; commercial, -1.8% and 4.9%, respectively (with retail, -5.1% y/y, and warehouse, 20% y/y); manufacturing, 1.1% and 4.4%; and office, 0.8% and 13%­. Private residential spending increased 0.6% in September and 5.1% y/y. New multifamily construction rose 8.7% and 8.2%, respectively; new single-family construction, -0.8% and 3.1%; and residential improvements, 0.1% and 7.0%. Construction employment, not seasonally adjusted, increased between September 2017 and September 2018 in 278 (78%) of the 358 metro areas (including divisions of larger metros) for which the Bureau of Labor Statistics (BLS) provides construction employment data , fell in 42 (12%) and was unchanged in 38, according to an AGC analysis  posted on Tuesday. (BLS combines mining and logging with construction in most metros to avoid disclosing data about industries with few employers.) 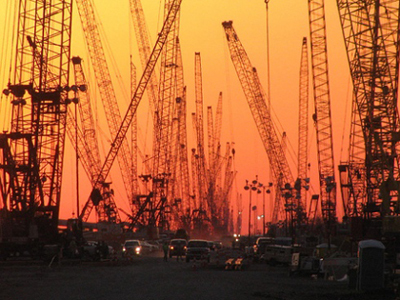 The largest gain again occurred in Houston-The Woodlands-Sugar Land (29,500 construction jobs, 14%), followed by Phoenix-Mesa-Scottsdale (14,600 construction jobs, 13%) and the Dallas-Plano-Irving metro division (14,100 combined jobs, 10%). The largest percentage gain was in Naples-Immokalee-Marco Island, Fla. (27%, 3,600 combined jobs), followed by Midland, Texas (23%, 6,600 combined jobs) and the Miami-Miami Beach-Kendall division (22%, 9,600 construction jobs). The largest job loss again was in the Middlesex-Monmouth-Ocean, N.J. division (-4,000 combined jobs, -11%), followed by the Newark, N.J.-Pa. division (-3,000 combined jobs, -6%); the Camden, N.J. division (-2,500 combined jobs, -11%) and Spokane-Spokane Valley, Wash. (-2,100 combined jobs, -14%). The largest percentage loss occurred in Spokane-Spokane Valley, followed by Camden and Middlesex-Monmouth-Ocean. Employment was at a record high for September in 59 metros (dating back in most areas to September 1990), the most September peaks since 2006; four areas set a new September low. The employment cost index—a measure of compensation (wages, salaries and benefits, including required payments), which BLS released  on Wednesday for the third quarter of 2018 (2018Q3), showed mixed changes from prior periods. In the private sector as a whole, total compensation increased 0.8%, seasonally adjusted, from June to September (up from 0.6% in Q2) and 2.8% from September 2017 to September 2018 (up from 2.6% between September 2016 and September 2017). Compensation for all employees in the construction industry increased 0.3% in Q3 (vs. 1.0% in Q2) and 2.7% over 12 months (unchanged from the prior 12 months). Wages in construction increased 0.7% in Q3 (vs. 1.1% in Q2) and 3.0% over 12 months (unchanged from the prior 12 months). Construction compensation data-provider PAS, Inc. reported  on Friday in its latest Contractor Compensation Quarterly: "Merit-shop contractors anticipate skilled craft hourly wage increases of 3.2% in 2018...Actual increases for 2017 were 3.4%... for all craft, contractor types, sizes and regions of the country. Interestingly, WorldatWork reports 2018 actual construction increases at 3.6% for nonexempt hourly nonunion positions. We think they're closer to the correct percentage and that our survey participant projections are low...historically, it's not unusual for our projected numbers to be about half a percent lower than the actual year-end figure." Construction costs increased for the 24th straight month in October, consultancy IHS Markit and the Procurement Executives Group (PEG) reported  last Monday. "Materials and equipment pricesrose at a slightly slower pace in October... Price increases for materials and equipment were stronger in 11 of the 12 subcomponents in October. Only heat exchangers had flat pricing; there were no categories with falling prices. Copper-based wire and cable had the largest gain compared to September. 'We expect steel-pipe prices to decline moderately over the remainder of 2018 and into 2019,' said Amanda Eglinton, principal economist – pricing and purchasing, IHS Markit. 'The elevated steel-pipe prices in the last two years were driven by higher steel input costs; with falling steel costs, steel-pipe prices will also move down. However, upside pricing risks remain, with quotas on Korean and Brazilian imports as well as higher demand from the energy sector.' Current subcontractor labor prices increased at a slower pace this month...Despite this retreat, October marked the 15th straight month of increasing prices." Distributor New South Construction Supply reported  on Monday in its monthly e-newsletter, "Dow Building Solutions, a division of The Dow Chemical Company, announced on October 11 a price increase of 7% on all Styrofoam extruded polystyrene insulations effective November 1....BASF Construction Systems notified their distributors on October 1 that they will implement a price increase effective November 1 on their entire line of construction chemicals, waterproofing items, sealants, concrete repair products, and floor hardeners. The amount of the increase...will range from 2% to 10%." Register  now for complimentary webinar on Thursday, Nov. 15, 2-3:30 pm EST: "Tariffs, Trade and Transition: Post-Election Design & Construction Outlook" with Chief Economists Ken Simonson (AGC), Kermit Baker (AIA) and Alex Carrick (ConstructConnect).